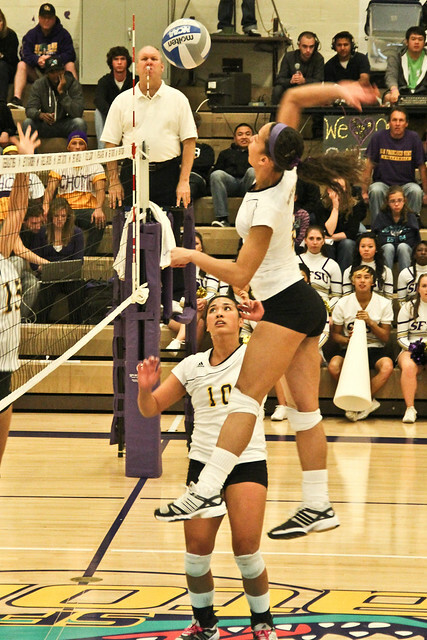 SF State's Halimah Oswald (8) goes up to spike the ball at a game against Cal State L.A., Nov. 4. The Gators lost the game in a 3-0 sweep. Photo by Andrew Lopez. It was a lackluster night for the SF State volleyball team, suffering a 3-0 sweep at the hands of visiting Cal State Los Angeles in the penultimate home game of the season. The Gators committed 23 team errors on a night in which the team already had difficulty scoring and were easily overtaken by the Golden Eagles, 25-14, 25-7, 25-22. That was the general consensus of the night: Individually and as a team, the Gators just weren’t ready. Johnson had six kills with five errors out of 18 total attacks, resulting in lowly .056 hitting percentage, but it was a night where the team average was an .053 percentage. The Golden Eagles ruled the court almost immediately. The Gators opened in their usual fashion, scoring the first point of the night on a kill by Halimah Oswald, but the Golden Eagles quickly took over the scoreboard. The team’s errors mostly came from hitting out of bounds, Hall said. She also added that the team’s passing wasn’t on, resulting in low scoring from the Gators. For Johnson, it was all about the team’s attitude. The team hosts CSU Dominguez Hills tomorrow night at 7 p.m. in the final home game of the 2011 season and will honor the team’s five senior players as part of Senior Night before the game. For teammate Hall, another senior, it’s just another reason to move past tonight’s loss.